So, yeah, you might have seen on Facebook that we have a 10 week old Goldendoodle puppy. I’m thinking most people think we were bit crazy to get a puppy now, but that is kind of how we roll at our house. A few weeks ago our girls decided that their younger brother, who just turned 11, needed a puppy. I was thinking, yeah, sure, Winston is 16 now so yeah, we could start thinking about a puppy. Next year when things settle down a bit. Yes, sure. Let’s plan it out so we’ll be all ready, NEXT YEAR. We’ll fence in our yard and THEN we’ll get a puppy. Yes. Right now we have pallets crashing boom banging on my deck and paint flying off of ladders and we are busy relaunching our church this fall in the new building. We’ve got lots to do. And now, we have Jack. So, yeah. We kind of adore him. Oh, I want to eat him up!!! You are so right Melissa – how could you say no to that face??? So adorable – enjoy him! Jack is adorable. Does Winston like him as much as everyone else? Best of luck with the new addition! He is is the cutest thing I’ve seen! I have a labradoodle, and she’s the sweetest baby we’ve ever had. In fact, I use her a lot to model on my blog! I hope you’ll share Jack a lot! Whoa, that is a big boy!! Ha! All the more fluffiness to love, huh? Soooo loveable!! ¦] And great pics too! What kind of camera is this please?? My daughter took these pics with her Canon Power shot, a tiny little point and shoot! Pretty good shots, huh? Jack gives such sweet kisses! Oh, yeah, we dog lovers are crazy like that. I just got a new puppy to run our count to three dogs and two cats. That’s so dumb, but I love ’em all. Enjoy that adorable little guy! Oh Melissa – what a cutie!! Enjoy him! I would say you have a great spirit of adventure, considering all the things you have going! My “adventuresomeness” does not extend to pets right now. For a while I will enjoy the fact that all of my kids are now potty-trained(!) before we add any animals that need potty-training. But Jack’s cuteness could make a person reconsider for a moment or two! Love knows no timing …. it comes when it comes in the shape it comes in. It may be easier or harder in what all else is going on, but love is love and it is the greatest gift of all. Oh. My. Goodness. Jack is seriously the most cutest dog I think I have ever seen. He’s a superstar! Waaaayyy too cute and adorable to not have in your life. 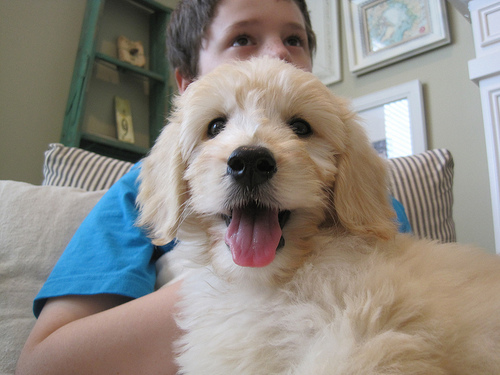 We have two Goldendoodles – I know he will be a great dog!! Awe, puppies – so cute, curious and playful! I miss those days – well…..kinda! :-) It is always nice having a trained dog – one who knows not to jump, one who knows ‘where’ to go potty and well….ya know! ENJOY!!! What can I say: Jack is adorable!!!! So adorable!! We just got a puppy 2 weeks ago. Not the best of timing and nothing was ready so my husband had to spend the day securing the yard and doing all the things we should have done “before” bringing her home. But the love and joy she has brought as been amazing! Enjoy!! Nice to meet you Jack! We have a black goldendoodle puppy named Ruby that we got 4 weeks before we moved three hours away. Yes, we are crazy just like you! We LOVE our doodle and you will too! Can’t wait to watch Jack grow up on the blog!!! Congrats! Thanks, he is looking forward to hanging out here :-) Ruby is such a cute name, by the way! I. Could. DIE. He is SO darling!! I SO want a puppy… but I have my hands full with the feline variety right now. He’s so cute melissa… congrats. How big does that breed get? Is the poodle half the traditional size or the toy? He has a cute face. This dog should be around 45-50 pounds! He’ll be a big fluffy face :-) The poodle was the dad and he was a small standard size and the mom was a beautiful smallish golden. So sorry Lindsay, it is so awful losing a dog. I’ve been through that and know just how you feel. A puppy might just be the best medicine! We’ve GOT to meet up!!!!!!! He wants him to come and hike a trail on Bainbridge! Doogan and I are IN LOVE with Jack! I can tell…he’s going to be a BEAUTY!!! A friend of mine has a Goldendoodle on Bainbridge named Oliver. He is seriously the most INCREDIBLE dog I have EVER seen! Everyone on Bainbridge thinks Doogan is a Goldendoodle! Doogan sends wags and I send SNUGGLES to Jack! Hugs and LOVE from Bainbridge! Did you head South for that boy? Yes, you caught on…where else within driving distance could I find a homegoods and a puppy on one trip! Ha!!! Yes, as soon as Jack can venture out (when the vet gives the OK to head out in public) let’s definitely have a Doogan – Jack play date!!!!!! He will LOVE DOOGAN!!! Oh my cuteness! He’s adorable! We got a puppy last fall “at not the right time”, but we lived through it and couldn’t love her more :-) Good luck! Saw the picture yesterday and had to investigate: went back and looked at Winston and thought this must be a close-up of him. What a gorgeous face and that puppy fur. Yep, I am in love, if we lived near each other I would offer to puppysit and I would be over to visit all the time. Puppy love! I have a pic of her on my “about” page on my blog. They are just the BEST dogs :) Have so much fun with him!! They grow so fast…Im missing the puppy stage already!! I have only had him for three days but already we can tell he is AMAZING. His temperament is PERFECT! And he hasn’t been annoying even once, no crying all night like we were expecting! He SLEEPS!!!! Adorable!! So fuzzy and I love that nose!!! We are the proud new family of a goldendoodle too or at least will be in 2 weeks!!!! We are so excited and are busy trying to find a name. Hop on over to my website for a look. Any pointers?!?! This is my first time ever having a puppy let alone dog. Oh my goodness he is adorable! I had to watch it a couple of times. When we got Prince it was unplanned too, but oh my, what a blessing, and a lot of work. But so worth it. Enjoy puppyhood! They are like babies, it goes too fast. Jack is adorable!! I have a question for you though. How on earth did you handle Winston’s barking? Assuming he does…We have a young Westie and any time we let her outside she barks and barks even if there is nothing to bark at. Would love to know if you had this issue and what you do about it ha! You’re right; you can’t say no to that face. The best mom’s are those who let their little boys have a puppy… have fun. We have a 1.5 year old Goldendoodle. Best. Dog. Ever. Enjoy! We got our Golden Retriever mix, Jonathan, just like that. We already had two dogs and I wasn’t ready for another one, especially a non-house-broken puppy. But that was before I saw his 10-week-old face. And the price tag (free). That was three years ago, and now that our other two dogs have gone to doggie heaven, I don’t know what we would have done if we hadn’t had him to fill the void. He is the best dog we’ve ever had. I know you will love Jack for years and years! He’s so adorable! And I love his name!! I believe those that are loving to dogs receive rich blessings in return. Very happy for all of you. He is absolutely adorable!!! i wanna take him home with meeee! We have a wonderful cockerapoo and we love her so much. It is always the right time to have a pup!! I have a golden that is now twelve and I am starting to look at puppies as our home would not be our home without a four legged family member. We have two cats that sleep with our golden Chloe in the winter. Jack looks adorable!!! Best wishes to your newest family member. what a cute dog you have! My apartment won’t allow dogs but your post made me want to have one now. Oh, my! We have a labradoodle and I’d like to add a 2nd dog to the mix. I’m thinking goldendoodle. Jack is so cute! I’d love to know where you got him. We are in the Seattle area. Congrats!! We have had our goldendoodle,Ruby, for the last 6 years and she is by far the best dog EVAH!! They are smart, loyal, loving and make the best pet. We can’t imagine our lives w/out her! Enjoy! We have a female Goldendoodle, Bailey, who is almost 3, BEST. DOGS. EVER!!!! Enjoy your new family member! Jack does have the sweetest little face! My daughter and I are wanting a goldendoodle. Maybe one day soon. we love doggies over here and Jack is so precious. There is no way you could say no! We have a golden/black cocker mix and she is so sweet. Thinking a goldendoodle may make a good buddy for Claire. If only I can convince my husband. I love dogs! And who could resist this face! I screamed with utter joy seeing your new baby! So cute! Thank you Connie :-) I’m so happy to have him!! oh how cute is he?!!!! How’s your Westie handling the new bundle of fur? what a sweetie!!! I’m so excited for you and your family. Personally, there is NEVER a bad time to get a puppy and yes, every 11 year old boy should have one. Besides, who wouldn’t love that face…what a great new family member. BTW, lots of folks in our neighborhood have labrodoodles or goldendoodles and they all say the same thing, “these are the best doggies”. Congratulations! You’ll get all the other stuff done, I have confidence in you. Oh my goodness…he is so precious!! He is adorable! We are getting our second dog in a week for our current dog to play with. We are very excited. Have fun and best of luck with everything! Some friends of ours have a Goldendoodle named Daisy. She is absolutely the best dog! I hope yours is half as sweet as there’s is. Congratulations on the new family member! We have one too, “Gracie”… and she looks a lot like yours. She is 8 months now, and really, I don’t think I will ever have another breed. She is eager to please, sweet, gentle, and very calm! Ahh, Jack is precious!!! We have a GoldenDoodle, Tucker, who will be 5 this month. He is a loyal friend, smart companion and my heart on four legs. I will readily admit that he was a crazy puppy. So I highly recommend training as soon as he’s old enough. Enjoy him! Oh how adorable!! we have two Goldens (not the mixed kind) and they are wonderful. Now that my daughter has looked over my shoulder and read this post with me… she wants a Goldendoodle too!! Give that cute puppy a hug for me. and I LOVE THE NAME. hah! Yes, a friend of mine got a Goldendoodle last year, he’s a year and a half now–huge, black, and too smart for his own good. I did a lot of puppy sitting for him when he was brand new. Such a cutie. He’s adorable, congratulations!! My kids are dying for a puppy but we just aren’t ready right now. Awww.I have never gotten a pup at”the right time”.Mine have been rescues all adult life so it was when they needed me.Hindsight being 20/20,it was the perfect time.Once,it saved both our lives&she became my home PT as I wrapped up pool therapy&learning to walk on land again.MissWoogie was my “feverdog”&knew when the lupus was tuning up b4 I did.Xena found@2mos by regional sales mgr friend in industrial park,beaten,burned&starved.They had 6 little rescues&knew what a beauty big girl Woog turned out to be.So I took saucerfeet about the time Mom’s femur snappd above the knee replacement-she saved Daddy.He was so worried4momma had PE postop&was nasty to us.Broke his heart.His”grrrls”he called”humans in dog suits”made it better when stayd w me.In 03 momma inpatnt almost 2mos with stones blocking all 3ducts,liver,pancreas,gallbladder.By then the poststroke dementia was really bad,wound up pneum&chest tube&had do open surg.Told him had get pittie,spay heald-what?! Saved again-giggled4weeks.PupSpitHeals.Lost him7/17. PS-tho I was teased incessantly about “my” 30barn cats, and if it “crosses the property Susan names it&feeds it”, my horse was a rescue-by Daddy. And didnt even get the ramps down on cattle truck-she ran&jumped in to go with the nice man! So pretty with her big pink bow just after 10th bday. And I shoveled@5a in blizzards&carried water when pipes froze-cuz that’s what I was taught. God’s creatures&blessed by the land-it was ours to be stewards. Full obit at http://www.bauerfuneralhome1943.com -all that was daddy is what makes me tick. Am a daddy’s girl always…broken but will “get back in saddle”. And protect momma for him-70yr love affair almost 66anniv/Oct. Iwo Marine&WAC-yes momma wore Army boots@Pentagon troop logistics.Went rabbit huntin’ in KY &came back w a “dear”. (daddy joke :) ). LotsaLove to JackPuppy. It will be perfect-always is. So adorable! It’s like a kid, if you wait until everything is just right, you’ll never have one. So you did the right thing. He’s awesome!!! I love you’re new baby and Im sure he’s happy he can’t get into much trouble now that there is a special place fixed up . We have gone through this many times ourself,there is never a perfect time to getting a pet you just do it and start making changes. We got a rescue puppy a little over a yr. ago and we work on making changes sometimes week by week as the puppy gets older. If you can take your pet to traning school, this is very effective and fun for them so he can learn and you too so you can understand their needs. Best wishes to your family and traing your litte one. I also got a puppy a few years ago before my German shepard got too old. Our sheltie mix puppy was a great companion for me and our older dog. Jack looks like he’ll bring your family alot of joyful memories. Love your site! Adorable baby boy you have!! We have a goldendoodle too named Oscar. He’s 4 and is the most AMAZING dog ever! He’s actually a rescue dog. We got him after he’d already been re-homed 6 times!!! can you imagine EVER rehoming a goldendoodle?? I can’t! especially since he’s the sweetest guy ever! And did I mention potty trained?? Ya…he’s perfect! You will adore jack even more as he grows. They are amazing with kids too! 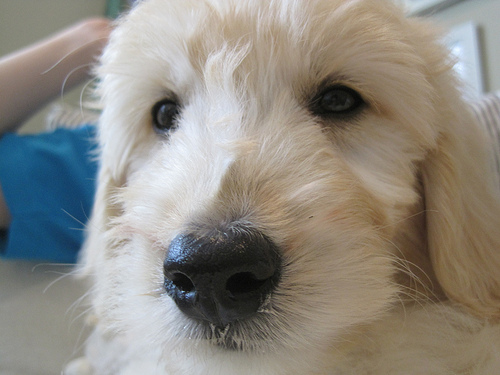 Can you give me the information for your Goldendoodle breeder please? We live in the Seattle area and are looking to add a Goldendoodle to our family. We have a Golden Retriever. Thanks. You have a Jack I have a Dukie. Jack is a doll baby. We have a doodle, Remy. He’s about a year older than Jack. 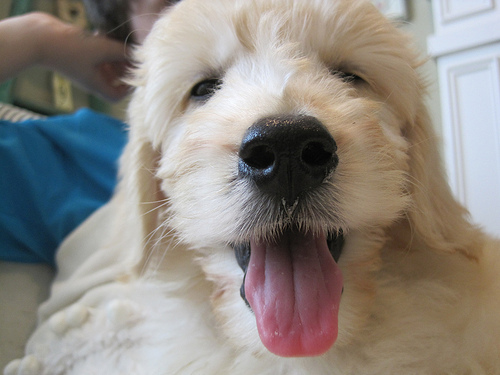 I’ve absolutely fallen in love with goldendoodles and I plan to be a life-long doodle owner. Oh my. My heart has being going pitter patter for one of these for awhile now. I want one so much! What area do you live in? Jack is absolutely adorable!! My family is considering a labradoodle, and we love the look of yours. Please could you share where you got him from? Do you have a breeders name and contact details that you could pass on? All the very best of luck and love in having Jack in your family. Jack is our favorite!! We visit him everyday!! HE IS THE CUTEST! LOVE! Your little doggie jack is adorable.Im assuming he is not so “little” anymore, Figuring you brought him home in july? or sometime this last summer? Anyway me and my family got a golden retriever this last summer as well for my 8 year old brother, im 26 incase you were wondering not 12, and he has turned out to be the most wonderful dog we have ever had…and he is only six mo! (fingers crossed). I have had golden retrievers all my life, then I go t maried, and the soon to me ex hated dogs. I don’t know if you are selling this dog, but money is hard for me, he cleaned all the money I had. I would be willing to make paymates, so I guess I just pray to God, that someone would help me. If you don’t contact me, I really do understand. God Bless you all., and thank you for reading this pasetic letter. I just need somone to love me. Jack is absolutely PRECIOUS! We have had several yellow labs and a golden retriever with fabulous personalities but never a Goldendoodle. We are considering making a doodle addition to our family. From where did you find Jack? A Breeder? Hi Ashley, yes, we got Jack from a breeder in Newberg, Oregon. :-) Enjoy your search for your new family member, they are a wonderful (but highly energetic!! HA!) dog. I LOVE the blog! just found it!